To thaw Haskell’s Lobster Tails, cut open one end of the vacuum-pack plastic bag. Place the bag of lobster tails, open side up, in a container of cold water for 30 – 45 minutes. Remove lobster from the bag, rinse briefly under cold water, pat dry and proceed with your recipe. 1. To boil Haskell’s Lobster Tails, place whole lobster tails in 6 cups of salted boiling water for 7 minutes. 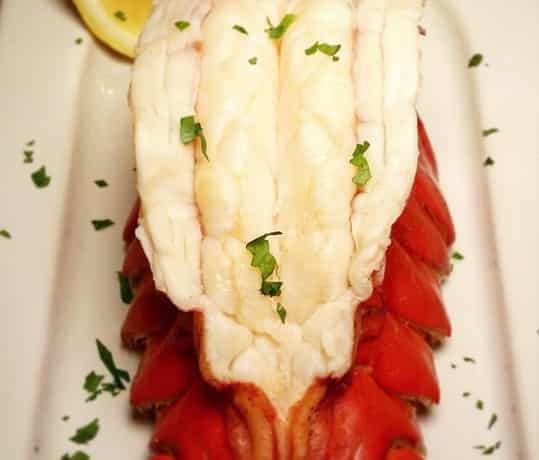 Remove lobster tails from the water and serve with melted butter and a lemon wedge on the side. insert, cover tightly and steam for 8 minutes. Serve with melted butter and a lemon wedge on the side. 3. To grill Haskell’s Lobster Tails, brush whole lobster tails with a mixture of olive oil, fine chopped garlic, salt and pepper. Grill the thin-shelled bottom side of the lobster tails 4 – 6 minutes over medium heat. Turn the tails over and grill the round, hard-shelled side another 3 – 4 minutes, until the meat is opaque and tender. Squeeze fresh lemon juice over the hot shells and serve with melted butter. lobster is opaque and tender, serve immediately with the pan juices and a lemon wedge on the side.